Chasing Davies: Latest Ways to Wear Scarves and How-to Videos! 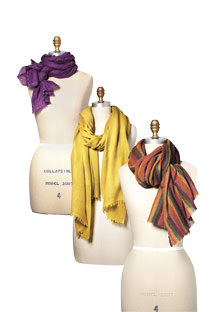 Latest Ways to Wear Scarves and How-to Videos! Oprah had Adam Glassman on her show this past Tuesday (11/2), and he demonstrated a few options for how to wear scarves and pashminas. We call it "the Celebrity Braided"
How do you where your scarf? Have you seen this "Braided" way? Will you try it?